The Phoenix Walking Group began publishing walking articles in PALS Magazine almost three years ago. Interest soon grew with requests for back-copies and so it was decided to launch a book that contained not only walks already featured but included several entirely new ones as well. There are twenty-eight walks in total varying in time from around two hours to three and a half hours to complete. They cover the Paphos District area from its boundary with Limassol in the east to the Akamas peninsula in the north-west. Included within the book are more than thirty colour photographs illustrating features on the walks. The authors, Sandy Sizmur and Colin Gorton, have each been leading walks within Cyprus’ hidden landscapes for some fifteen years but the book also has in mind holidaying visitors to the island as well – people who might wish to get away from the hustle and bustle of the coastal resorts, stretch their legs and seek the peace and quiet of Cyprus’ largely unknown countryside. 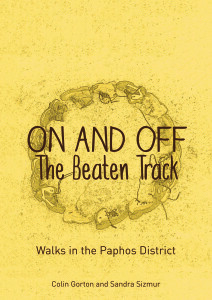 Published in December 2015, ‘On and off the Beaten Track’ provides clear and concise details to guide you on your way. Often commencing at small villages, the walks pass through some stunning landscapes with wide ranging views. For those not used to walking in our rather different climatic conditions advice is provided on what to take with you. In many instances the walk descriptions include both historic and geographic detail to offer the walker an awareness of a Cyprus from bygone days, a Cyprus that has only recently adopted a rather more European lifestyle. Note: The walk articles will re-commence in the March issue of PALS and will run every other month.